Proud mum: Lisa de Weger with her daughter Arianna. A YOUNG mum who conceived her first child through a leading fertility care awareness program NaPro, hopes other women choose this Church-approved method and not IVF. Lisa de Weger and her husband, David, have been married for three years and are blessed with daughter, Arianna. “She’s the biggest gift,” Mrs de Weger said. Arianna was conceived through the Creighton Model FertilityCare System and affiliated medical treatment program NaProTechnology. The Creighton Model is a standardized and internationally-renowned program that observes and charts “biological markers” in women’s health and fertility. NaProTechnology is an emerging medical science that accurately monitors women’s reproductive and gynaecological health. It has been known to treat infertility, ectopic pregnancies, ovarian cysts, and endometriosis, among other health issues. Dr Thomas Hildergs, an obstetrician-gynaecologist and reproductive endocrinologist of Pope Paul VI Institute in Nebraska, USA, started offering the technology in 1976. It was a blessing for Lisa and David de Weger. The couple married in 2010, when Lisa was just 20-years-old. Lisa assumed her youthful age would give her greater chances of falling pregnant and becoming a mother. But after a year and a half of trying for a baby, Lisa felt her dream of being a mum was “threatened”. “When I was told that I was possibly infertile, I thought, ‘Will we ever have kids?’” Lisa said. Lisa’s husband, David, was more optimistic. “He was never worried,” Lisa said. Lisa was using another system at the time, which was known to help women monitor their fertility. But the particular program “didn’t have an answer” for Lisa. It was Lisa’s sister who put her on to the Creighton Model FertilityCare and NaProTechnology. Lisa said NaPro and Creighton gave her the hope that she needed. 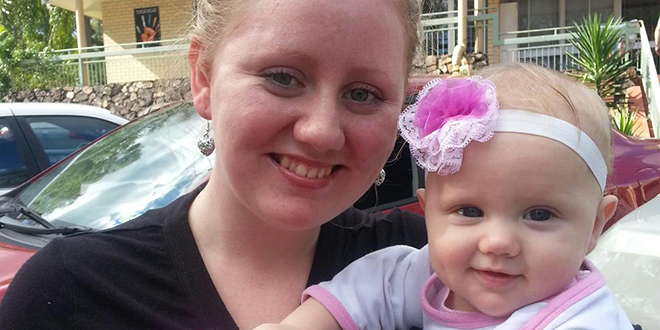 In five months, she conceived Arianna, a now healthy, happy nine-month old. Lisa is now determined to “spread the word” about Creighton and NaProTechnology, which are still relatively unknown as a viable option for women’s health care. “To women who want to get pregnant but have issues with their fertility, I would say give this the first go over IVF,” she said. The positive success rate of Creighton, not just for Lisa, but among other patients in Australia and around the world, has inspired Lisa to get on board with the technology. “Being on Creighton has awoken a passion in me to become a practitioner,” she said. With only three practitioners available in Brisbane, the need for more practitioners was great, Lisa said. One practitioner in particular has 82 clients and has difficultly maintaining any more. The only available training course for Creighton Model and NaPro is in Sydney, and runs for 13 months. For Lisa to become an accredited practitioner, she is required to raise half her tuition – almost $4000 – before she can begin the course. But the ever-optimistic young mum said raising the money was the least of her worries because she knows “it’s God’s will”. While Creighton and NaProTechnology are used to help women become pregnant, the programs are not limited to married women. Single women can also benefit from the technology, as it can identify irregularities that otherwise may go undetected. One religious sister even used the Creighton Model to show the benefits to her parish. The Creighton Model saved her life, as it picked up the early stages of cervical cancer. Lisa hopes to work with many single young women when she is a certified practitioner. “More women need access to good health care,” she said. “To me, it was clear that the Creighton Method explains the mysteries of a women’s cycle. “It identifies when a woman is fertile, and when they are infertile. “We aren’t told to know about our bodies, but appreciating your fertility helps you to be empowered to monitor your health. “Studies have also shown that these and other forms of Natural Family Planning are strengthening the integrity of marriage. “With NFP, a man becomes aware of a woman’s fertility, and it becomes a shared experience, not one-sided, unlike contraceptive methods. “The Creighton Method and NaPro are also in line with the Church’s teachings. “The code of conduct that practitioners go by is holistically Catholic. “Creighton and NaPro really gives couples a chance to exercise the values of their Catholic faith. Help Lisa to become a practitioner by visiting her fundraising website www.youcaring.com/tuition-fundraiser/-supportlisa/67724/update/63576.